It’s a known fact that parents’ blood types determine their child’s blood type. And whether a child has either one of his or her parent’s blood type or a different one, they will have nonetheless inherited it. Blood types are actually passed down from parents to child via genes variants called alleles. These gene variants essentially determine what antigen you are going to inherit from your parents for what blood type. An antigen is simply a cell marker, a unique identifying fragment on the surface of red blood cells that determines blood type. For example, there are antigens A, B and O for blood types A, B, AB and O and antigen D or RhD for Rh negative and positive blood types. The ABO and Rh or Rhesus blood types are the most well-known of all blood classifications because they describe antigens that are essential in determining blood compatibility in most people. Which also makes them the reference point when it comes to determining a child’s blood type based on that of his or her parents. But each of the 35 blood group classification systems all identify various antigens on the surface of our red blood cells. It just so happens that the antigens for the ABO and Rh blood groups are the most clinically relevant. 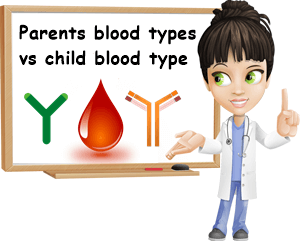 The next thing you need to know to better understand a child’s blood group based on parents’ blood types is the fact that antigens, these identifying markers on the surface of red blood cells, come together with antibodies. Basically, each blood type is characterized by a unique antigen and antibodies for antigens in other blood types. In the ABO system, a person with blood group A will have antigen A and antibodies for antigens B. A person with blood group B will have antigen B and antibodies for antigens A. This is essentially what makes blood type A and type B incompatible: the fact that each have antibodies for the antigens in the other, so the same antigen and antibody. What antibodies do is destroy foreign elements in our system to prevent infection and disease, like any other immune system cell. So the antibodies in the type A blood group will only recognize antigen A, but consider antigen B in type B blood group as a foreign element and try to destroy it. This incompatibility between blood types manifests as agglutination, a process in which similar antibody and antigen clump together and results in red blood cell destruction. 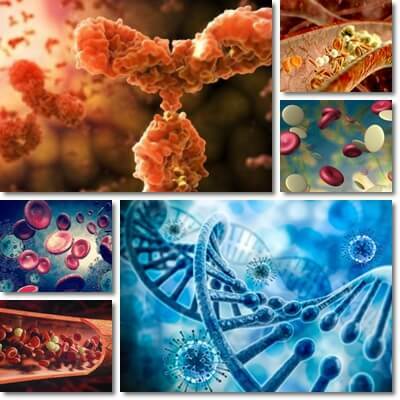 Within the same blood type, antigen and antibody are different from one another, so there is no risk of agglutination. Read about blood types compatibility, what are antigens and antibodies and more in the article What Are Blood Types and What Do They Mean? Parent to child blood type is genetically determined. Normally, you can inherit any of three variants of the gene determining the ABO blood type. But statistically speaking, you are more likely to have a certain blood type than others based on your parents’ blood types. Below is a comprehensive chart determining parents blood type and baby blood type. If parent 1 has type O blood (ii) and parent 2 has type O blood (ii), the child will most likely have type O blood (ii). If parent one has type O blood (ii) and parent 2 has type A blood (IAIA), the child will have type A blood because IA is a dominant gene, although he or she will still inherit a recessive gene for type O (that doesn’t manifest). Essentially, a child will inherit a gene for a certain blood type from each parent and the combination between the two will determine his or her blood group, factoring in the dominance of type A and type B genes over genes for type O blood.